If you’ve ever wanted to know how to make meatloaf that turns out succulent, juicy, and flavorful (and with that delicious outer crust! ), then this little guide has all the tips that you’ll need to prepare a delicious and easy meatloaf recipe that everyone will enjoy. 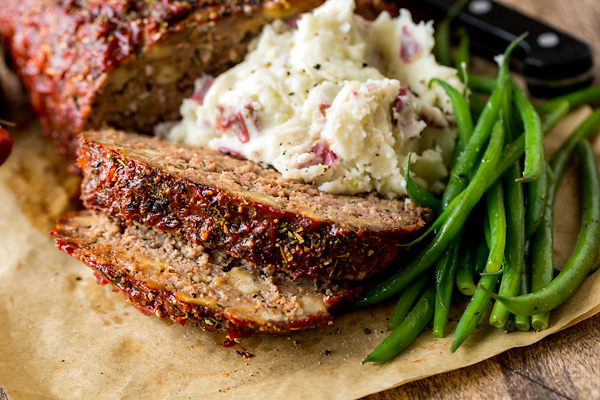 I absolutely love meatloaf, and find it to be one of my all-time favorite comfort food recipes to whip up with some fluffy mashed potatoes and maybe even some green beans when I’m craving something hot and savory. 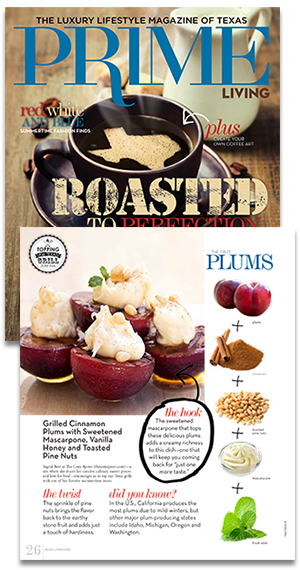 And in my recent days as a personal chef, it was one of my client’s favorite things I’d prepare for them as well. But I totally understand that not everyone feels the same way about meatloaf. Folks either love it or they’re simply not the biggest fans. And if they’re not the biggest fans, I would hazard to guess that it’s probably because they’ve never had truly great meatloaf. It’s one of those classic American recipes, one that consists of exactly what it sounds like it should consist of: meat and a few other ingredients to make it tasty and help it to keep its “loaf” shape as it bakes away in the oven. And if you want to know how to make meatloaf extraordinary and an utter pleasure to enjoy, it actually lies in those “few other ingredients”, and in some of the techniques used to combine all of those elements together. When the right ingredients in the correct quantities come together with some good technique, the result is a truly delicious meatloaf recipe from scratch, one that everyone will be sure to push their plates towards rather than pull their plates away from. OK, let’s start with the meat; after all, you can’t make meatloaf without it (unless you’d like to make a vegetarian “nutloaf”, but that’s not what we’re doing here…). Ground beef is my preferred meat of choice for meatloaf, but of course one can certainly choose to use ground dark-meat turkey, ground pork, ground lamb, or even a combination of any of those. 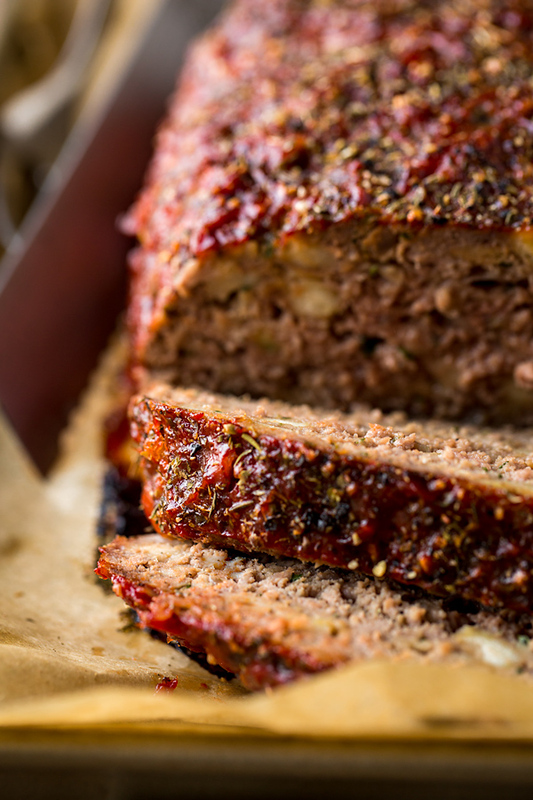 Heck, spicy or sweet Italian sausage could be blended in as well, but now we’re getting into a more “gourmet” category of meatloaf, and we want to talk basics here. The ratio of fat to lean is important when juicy, succulent meatloaf is the desired end result, and I prefer to use 85/15 ratio of fat to lean, organic ground beef. If you go too lean, the meatloaf will tend to be a bit dry; and if it’s too fatty, it’ll tend to be too greasy. You’re looking for a nice, moist, juicy “happy medium” here. Many recipes call for pre-packaged breadcrumbs, but my personal opinion is that freshly processed rolls work best. I swear by using French-style rolls (they can be fresh, or even better, a day or two old). I process them myself in my food processor for a minute until crumbly and fluffy. Sure, it’s a tiny bit of extra effort, but these fresher breadcrumbs make a difference. Then to these I add a bit of milk or half and half for a hint of moisture before adding them into the meatloaf mixture. Eggs are another important binding ingredient, and here’s my personal ratio that I don’t deviate from: one whisked egg for every pound of ground meat. It’s that easy. You really don’t need any more than that. And for the aromatic ingredients—those tasty little add-ins that create irresistible flavor—I like to very finely mince up about half of a large onion per pound of ground meat and saute it just until slightly brown, with a couple of garlic cloves. I also like to add to the meatloaf mixture a couple of good pinches of salt and black pepper, and a liberal sprinkle of fresh herbs. Sure, you can add in a sprinkle or two of grated parmesan cheese for added flavor, but that’s totally optional when it comes to a basic meatloaf recipe, and is completely up to you. All of these ingredients are added to a large bowl, and then using your hands (the absolute best kitchen tool you have! ), you carefully and gently mix the ingredients together just until they are blended and come together. You don’t want to over mix, as this will make the meatloaf tough. So gentle-yet-thorough is ideal. Also, skip the loaf pan—it’s truly better without it! 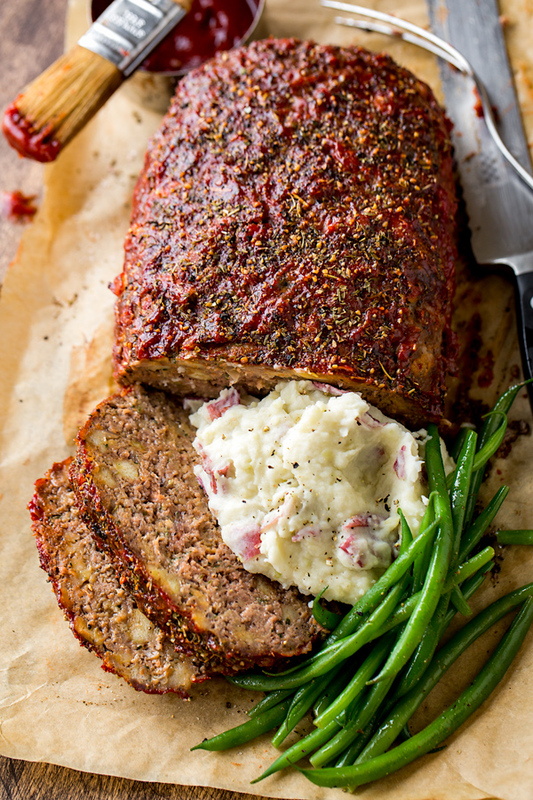 This way the meatloaf isn’t steamed, but rather gets a delicious outer crust—especially when a touch of ketchup is spread over top of it, along with a sprinkle of dried herbs and some course black pepper. Begin by lightly sauteing your finely minced onion and garlic together, and then set it aside for a few minutes to cool a little. Add your ground beef (or other ground meat, or combination thereof) into a large bowl along with some salt and pepper, your cooled minced onion/garlic mixture, your fresh breadcrumbs (soaked in a touch of milk or half and half), your whisked eggs, and your chopped parsley. Using your hands, gently-yet-thoroughly mix everything together until it is well-combined; turn your mixture out onto your prepared, parchment or foil-lined baking sheet, and shape, by hand, into a loaf shape. Brush the outside with some ketchup, sprinkle with some additional dried herbs, plus some cracked black pepper, and bake at 375° for about 55 minutes to 1 hour. Allow the meatloaf to rest for about 10-15 minutes very loosely tented with foil before slicing and serving. Good quality ground meat with the proper lean-to-fat ratio: Organic ground beef with an 85/15 ration of lean-to-fat is best for this meatloaf recipe. You can also use ground dark meat turkey, pork, lamb, sausage or any combo of these. Fresh breadcrumbs are best: Homemade, freshly-processed breadcrumbs, made from French-style rolls, are the best crumbs to use—they are very simple and quick to process, and the texture is ideal. However, if you must use prepared breadcrumbs, choose panko as they will hold the moisture from the milk or half and half better. Sauté your aromatics: You get the best flavor in your meatloaf when you lightly sauté your onions and garlic together for a few moments, just until golden brown. Skip the loaf pan, and shape by hand: Prepare a baking sheet with parchment paper or foil, and shape your meatloaf by hand directly on the baking sheet. This allows for the outside of the meatloaf to form a bit of a crust (rather than it steaming). And the crust is one of the best parts! Prepare ahead: You can certainly prepare the meatloaf mixture, and even shape it on a baking sheet, a day ahead of when you plan to bake it. Simply wrap everything with plastic wrap (don’t brush with ketchup or sprinkle the herbs on yet), and keep it in the fridge. Then, allow it to come to room temp for about an hour or two before baking. At that point, brush with the ketchup and finish with the herbs, then bake. 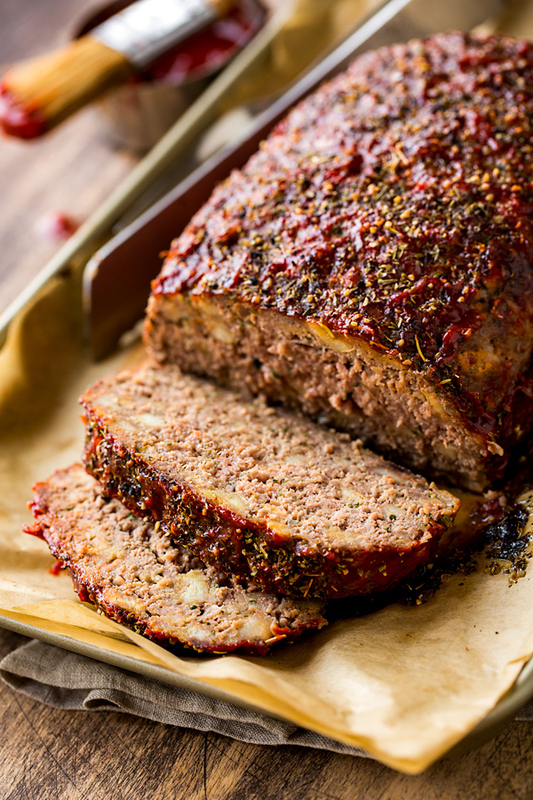 With this recipe I share how to make meatloaf the easy way for a juicy, succulent, perfect meatloaf every time—no more dry, flavorless meatloaf for dinner! -Preheat oven to 375°, and line a baking sheet with parchment paper (foil is alright as well, but the meatloaf may stick to it a little more). -Place a skillet over medium-high heat, and drizzle in about 2 tablespoons of oil; once hot, add in the finely diced onion along with a pinch or two of salt and pepper, and saute for 2-3 minutes until tender and slightly golden; add in the garlic, and once aromatic, turn off the heat and allow the mixture to slightly cool. -Place your breadcrumbs into a bowl, and drizzle over them the milk or half & half, and gently combine so that the crumbs soak in the liquid. -To a large bowl, add in the ground beef, along with 1 teaspoon of salt and about ¼ teaspoon of black pepper; add in the slightly cooled onions/garlic, as well as the moistened breadcrumbs, followed by the whisked eggs and parsley; using your hands, gently-yet-thoroughly mix everything together until well combined, taking care not to over-mix. -Turn the mixture out onto your prepared baking sheet, and shape into a (roughly) 9” x 5” loaf shape; pour ¼ cup of the ketchup over the meatloaf and spread it around to cover it, and sprinkle over the Italian seasoning, plus some extra black pepper (cracked pepper is great for this); bake for about 1 hour (or until the internal temp reaches 160°). -Once baked, brush or dot on the remaining ¼ cup of ketchup very lightly over top of it, just to lightly moisten that tasty caramelized crust that formed while baking, and sprinkle with a touch more chopped parsley and a little more pepper, if desired; allow the meatloaf to rest for about 10 – 15 minutes before slicing and serving. 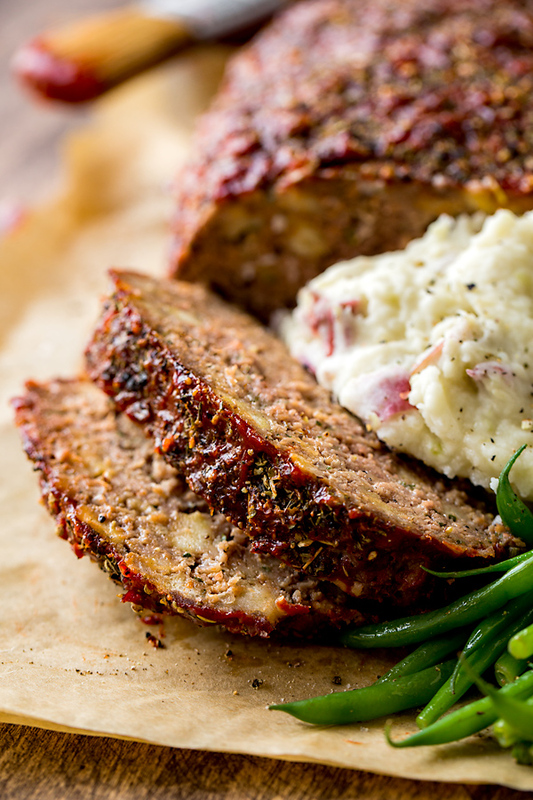 Looking for some other meatloaf-inspired recipes? Check out this BBQ Meatloaf Burger, and this Open-Face Crispy Meatloaf Sandwich! Thank you thank you thank you for posting. Every time I try to make my own meatloaf it never comes out like yours. I’m going to try this recipe next time I make meat loaf and I’ll let you know how it goes. 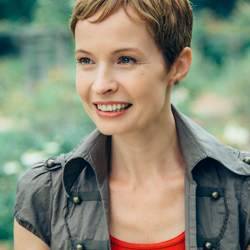 Hi Alex, so awesome to hear from you, my friend! I know that you are pretty well acquainted with this meatloaf recipe, lol, and I’m super excited that you’re planning on preparing it yourself— now you have my “secret recipe”, haha! I really hope you enjoy it, and I send you lots of hugs and love, and hope all is well! Made this tonight for my wife! Hi Alex, while I’m excited that you made this recipe, I’m even more excited to read “wife”—congratulations on getting married! I hope you both have a wonderful, blessed and amazing marriage, my friend…I’m so proud of you! Can’t wait to make this !! May be have the potato recipe ? Hi Maureen, but of course you can! I actually linked to both my basic, fluffy mashed potato recipe AND my green beans— you can find both of those links at the very top of my post, in that first paragraph under “Meatloaf, The Great American Classic” heading. They’re in red, and if you click on them, they take you to the recipes. Hope you enjoy this meal Maureen, and happy cooking! Would you use the same amount of panko as you would fresh breadcrumbs? What would the cook time be if you halved the recipe for a smaller crowd? I would go ahead and use the same amount of panko crumbs as the fresh; and as far as the cooking time, if you are cutting things in half, you’ll be looking at a cook time of closer to 40-45 minutes. But to be sure, do use that thermometer, and once it gets to 160°, you know you’re good. Seem pretty simple. Very beginners friendly. haven’t been able to master it. Will try your awesome recipe and see what happens. Best wishes on preparing this meatloaf, Lee! Hope both you and your hubby enjoy it!